An eye disease causing the loss of vision. PRA is caused by a recessive gene. This disease will slowly cause the dog to go blind usually at a younger age! There is currently no cure for PRA but it's up to the breeder to test and act accordingly! A condition where the kneecap slips out of place. PL can be genetic but also cause by injury, with the Papillon it's often from jumping too high, on or of things. When it happens there may only be a yelp, then nothing for a long time, unfortunately overtime the pain can be more and more because of interior swelling. The dog will now occasionally give a quick yelp and will start showing a limp or skips a step with that particular leg while running. It is easy to diagnose with manipulation and an X-ray can confirm. in most cases non-surgical treatment is sufficient. Good anti-inflammatory food (raw or home cooked) and in more severe cases anti-inflammatory medication and rest (confined space) with a good comfy bed will help. There are 4 gradation in Patellar Luxation. If a surgery is recommended delaying this will often result in Degenerative Joint disease like Arthritis. swelling will become Chronic and more pain. A liver shunt is a blood vessel that carries blood around the liver instead of through it. The liver filters out toxins, distributes proteins and stores sugar (in the form of glycogen). A constant blood flow through the liver is needed for it to function properly. While a puppy is still a fetus, growing in the dam’s uterus, it is the dam’s liver that performs all of these functions and this happens via a shunt (blood vessel) that connects fetus and dam. When a dam approaches the point of labor, the shunt closes, allowing the pup’s own liver to take over this work. However, with this health problem, this does not happen (referred to as an open shunt) or there is a genetic abnormality that causes the puppy’s blood vessel to grow outside of the liver (extra-hepatic). Signs of this serious health issue are: chronic vomiting, chronic diarrhea, chronic weakness, seizures and/or underdevelopment (the Papillon will not grow as expected and will be underweight with poor muscle tone) which results in a lethargic dog that does not have the energy to run around, play and be socially involved as he would otherwise. 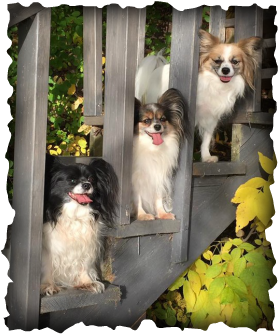 A blood test which checks bile acid levels will show if a Papillon has this condition. A higher than normal level indicates the presence of a liver shunt (an elevation higher than 100). An MRI, CT scan, or ultrasound will confirm this. Surgery is not always necessary. Roughly 50% of canines with this condition will need surgery to close off the shunt and this should be performed by a board certified veterinarian surgeon. A weakening or collapsing of the dog’s tracheal rings (the cartilage that surrounds the dog’s windpipe). It can be progressive (it becomes worse over time) or it can come on suddenly. The dog will have a deep hacking cough and will try to clear its throat often. They can have trouble breathing usually with exertion! A collapsed trachea is easily to diagnose with an x-ray. Cough suppressants (coconut/honey mixture 50/50) and the use of a bronchodilator can help. Rest may heal overtime in extreme cases surgery is needed. To avoid Trachea Collapse a harness is best on these little guys when on leash as the smallest tug or pull can already cause this.